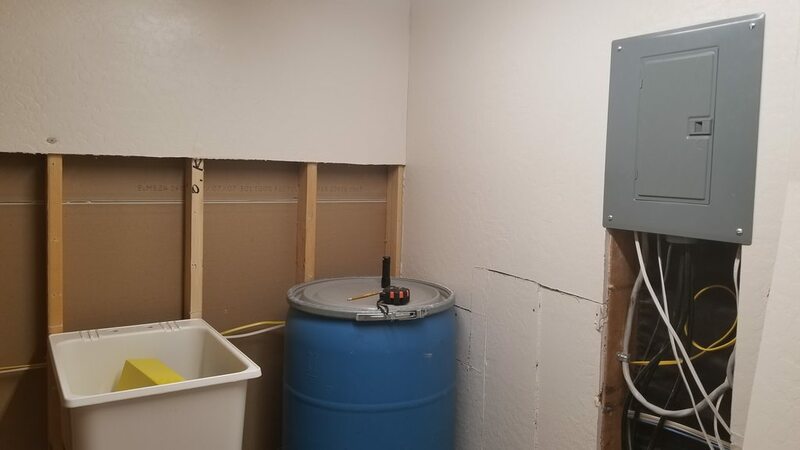 After a bit of a hiatus, I’m ready to finally get started on a 300 gallon in wall tank. This is something that I’ve been thinking about for a very long time, I purchased this tank circa 2012 when I lived in California (still active duty military) with the intent to upgrade my meager 125 gallon. The price for the 300 gallon was so right that I couldn’t pass it up. However, the 125 was doing so well and the logistics of where the new tank was going to go posed a bit of a challenge, which means the tank never made its way off the enclosed trailer I picked it up in. I retired in 2014 and in 2015 we moved back to a house we own in Wyoming. I set up the 125, why, you might ask?... Well, that one was basically turnkey and because I couldn’t go without a tank for too long! 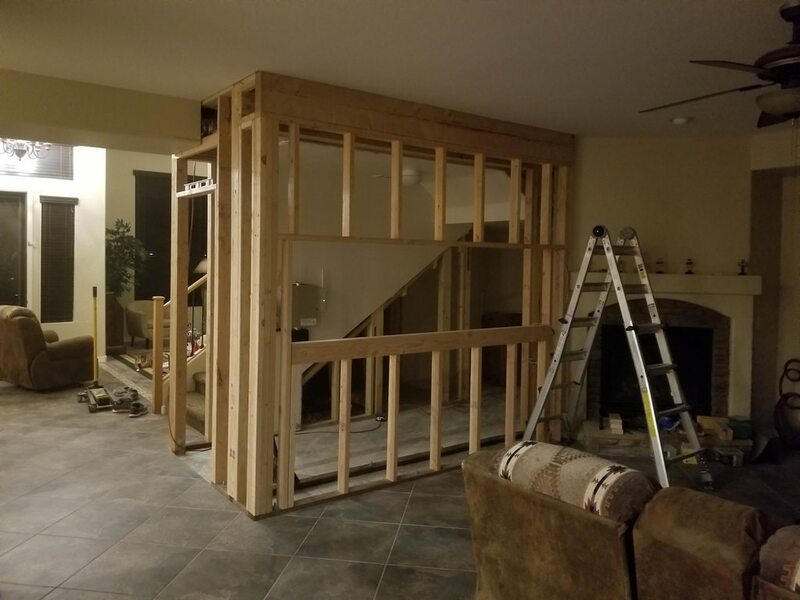 There in Wyoming, I had the perfect place to put the tank, which was in a wall that joined the family room with a small bedroom. 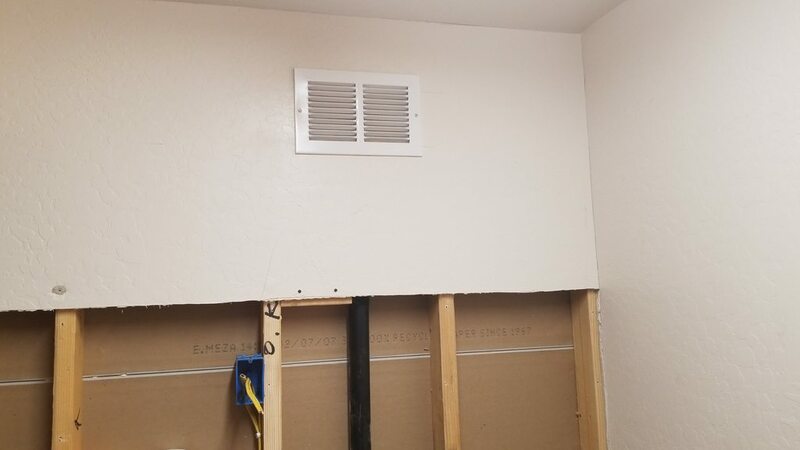 The small bedroom was to become the fish room and it shared a wall with a bathroom, which meant plumbing issues were going to be at a minimum. 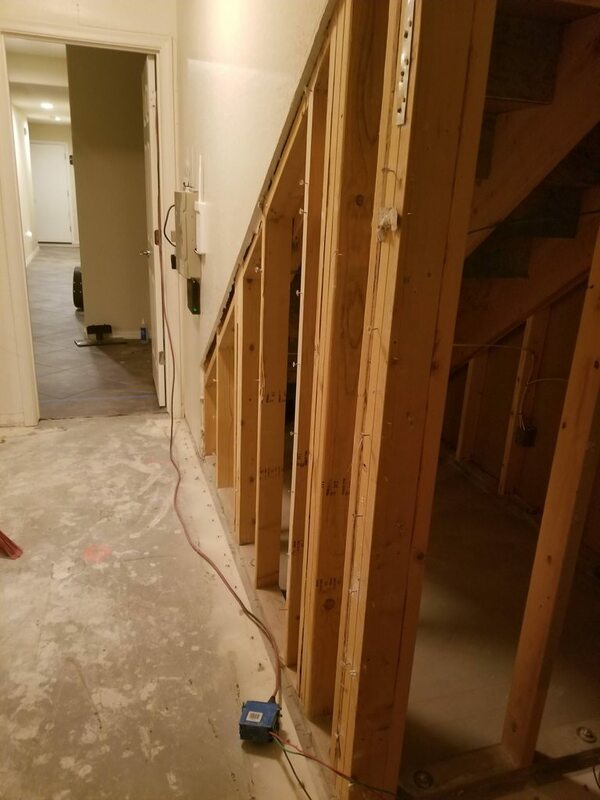 However, my wife was still working for a company in California that allowed her to do the job remotely, which meant that she needed to set up an office space….You can probably guess where this is going… Yep! The 300 again fell by the wayside, however, it no longer resided in the trailer, I had a spot for it in the garage…. PROGRESS! After a year in Wyoming, due to some unforeseen circumstances we decided to uproot yet again and move to Phoenix AZ. This time, when house hunting, I kept my eyes peeled for a house with the perfect spot for the tank, we found one, but got into a bidding war and we bowed out. The runner up had a spot that wasn’t ideal but I could make it work. At this point the trick was to lay claim to the spot before it ended up as a storage area...or an office space! Here it is: A small walk in closet that shares a wall with the living room and stairs on the other side. 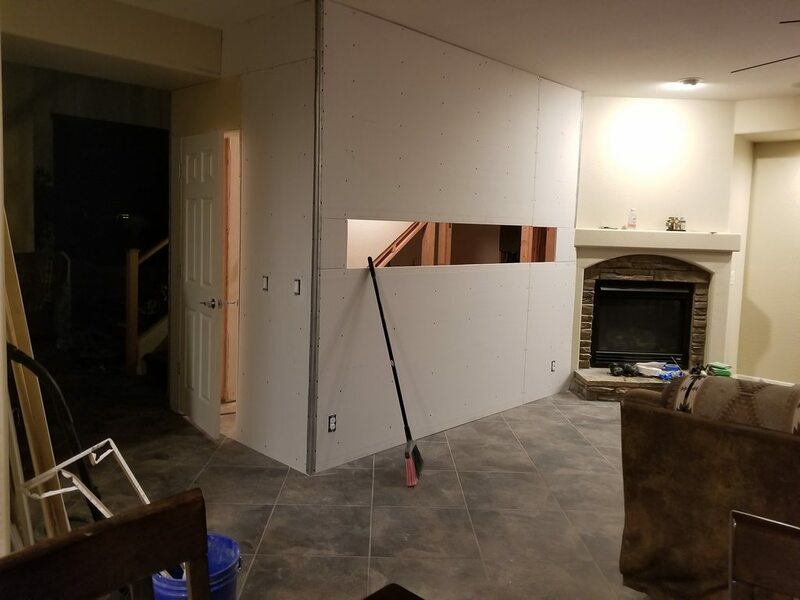 I needed to push 2 walls out roughly 13 inches on both. 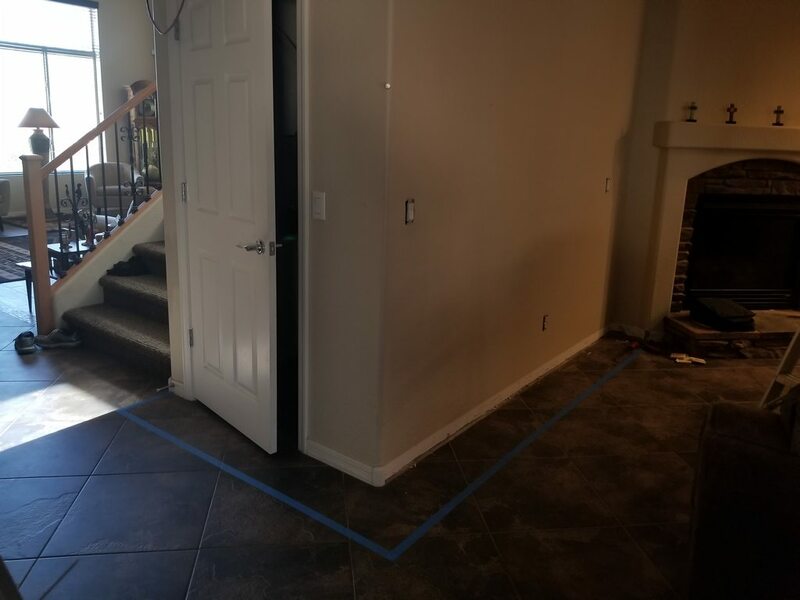 You can see with the blue painters tape where the new walls were going to be. 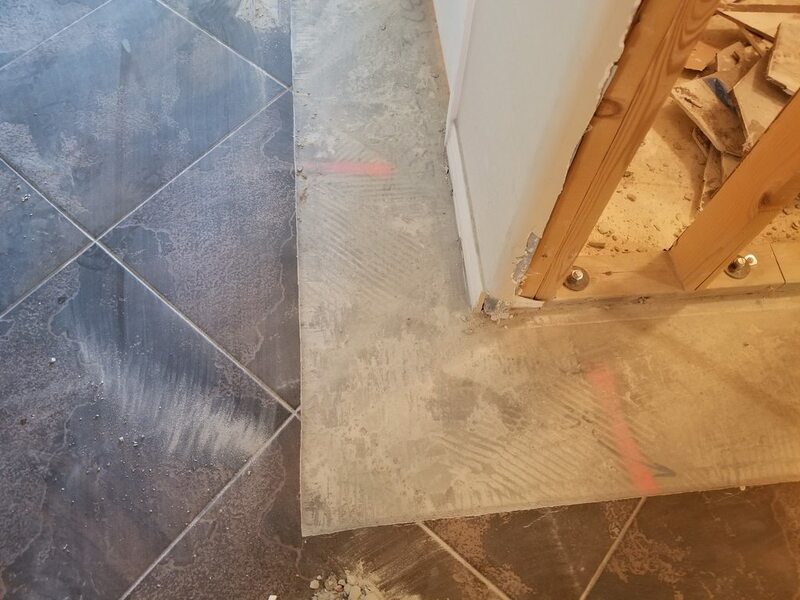 2. incorporate a glue laminated beam to support the floor above the existing footer and extend out the load with a steel beam on the floor to carry the load of the extra 13 inches on the wall with the door. Choice no 1 was ideal but destroying the concrete slab in which the house resided was out of the question and definitely not in th budget. So no 2 it is! 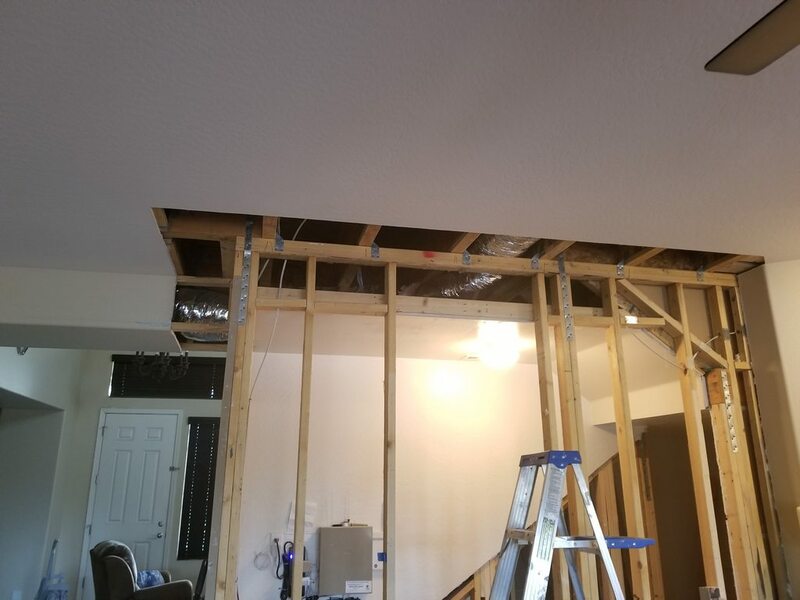 Pulled of all the drywall to expose the studs, cut power to the electrical wires that ran through. Exposed the underbelly of the stairs, that’s useable real estate! 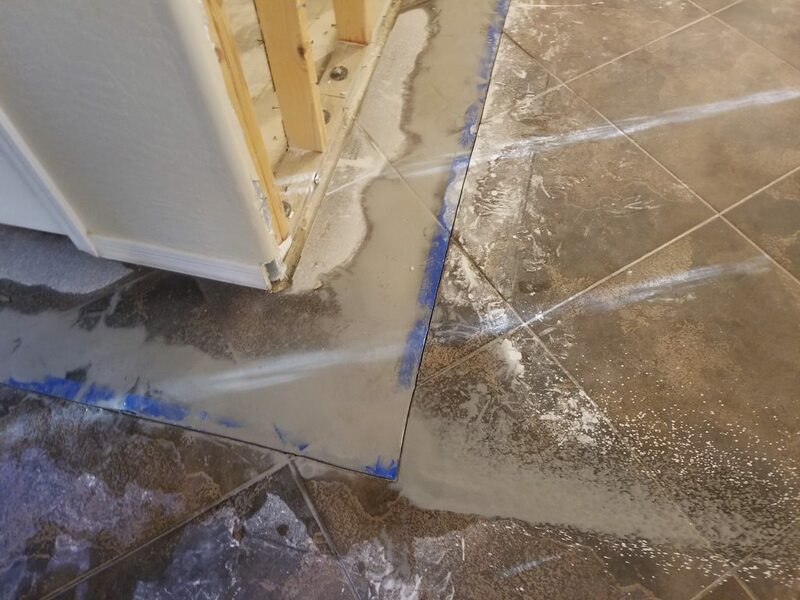 Removed the tile and cleaned it up. What a pain this was!!! Removing all the thin set from the concrete was tough too! Trimmed back just enough ceiling to put the wall up. 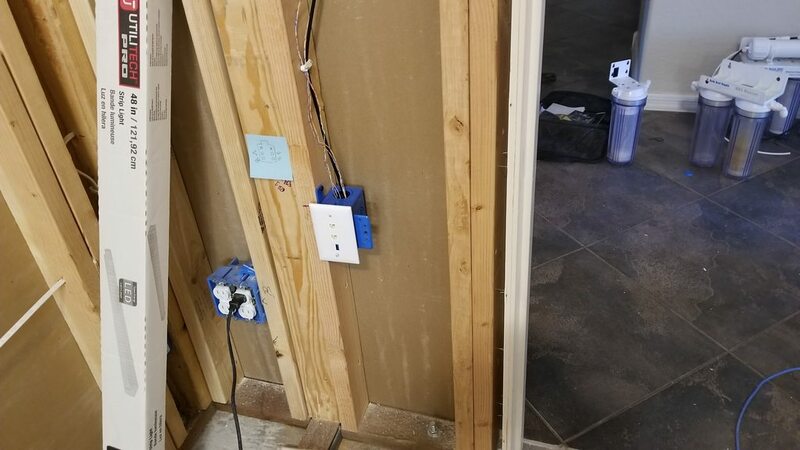 If you noticed in one of the first few pictures there was an HVAC register in the existing wall, I had to relocate that and also added a wye pipe to put a register inside the fish room. 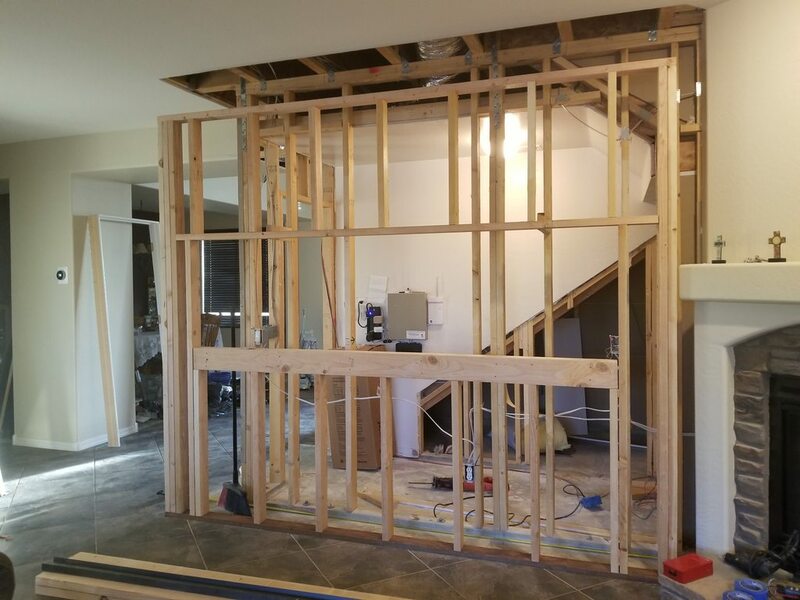 This part was tricky, before removing the wall that supported the load, I had to frame in the new wall using 2x12’s over the concrete that doesn’t have a footer. 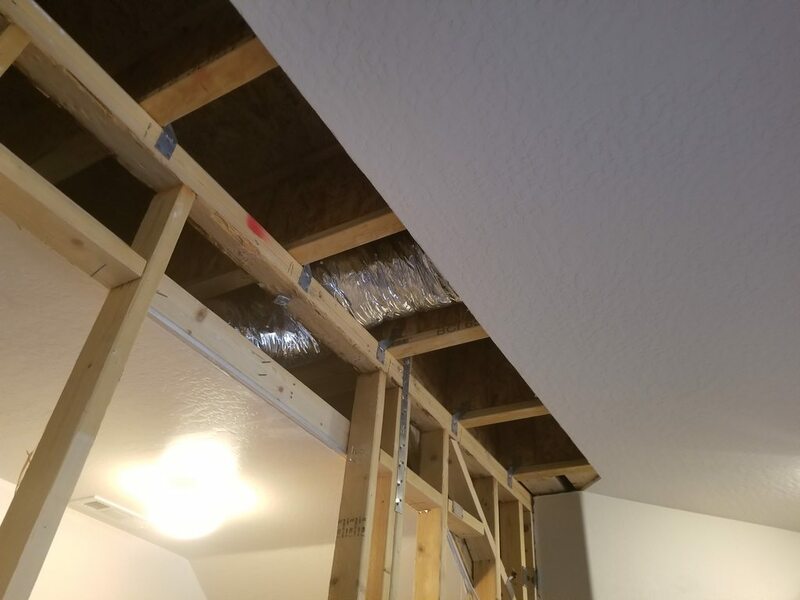 The structural engineer said that there wasn’t a big risk as long as I installed the glue lam beam rather quickly, I used a series of jacks to keep other beams up while getting the glue lam in place. 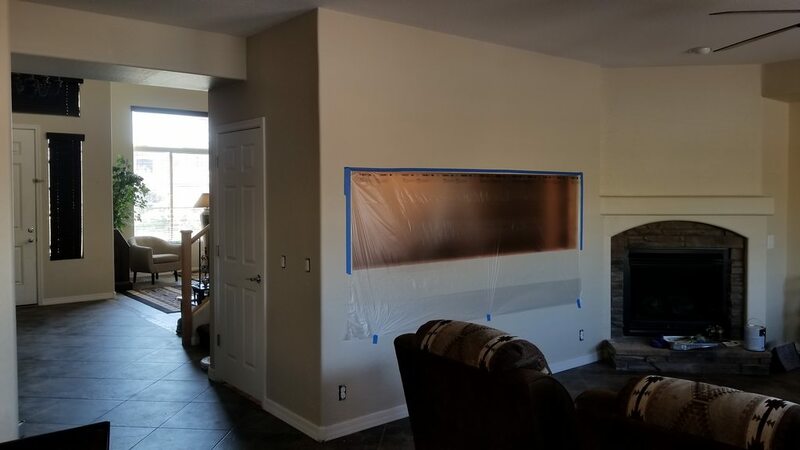 I had to leave it like that until the inspector cleared in and then roughed in electrical and drywall was next. 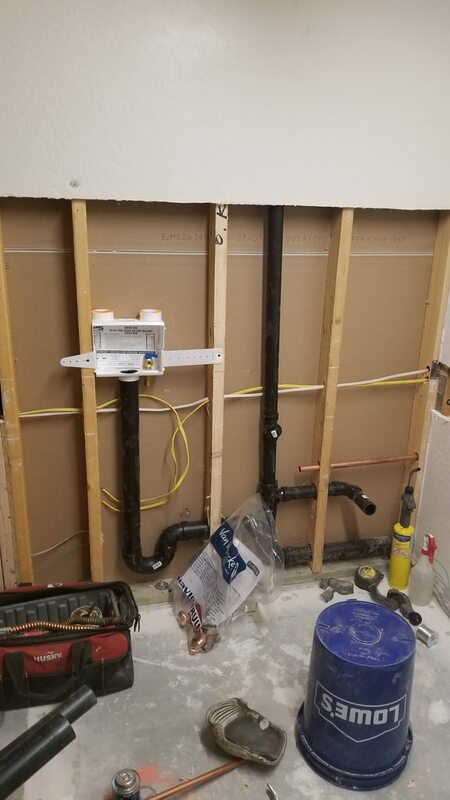 At this point I didn’t want to close up the walls on the inside because I needed them open for future plumbing. Plus I want to make this as clean of an install as I can which means that I want to run data cables inside the walls. I haven’t quite nailed down where everything is going to go yet so it may be a while before I can close it up. In order to make it look like the living room isn’t under constant construction I wanted to finish the outside. This is so cool to watch go up. Thanks for posting this. I'm following along. One thing that was a must for the equipment room is to have a sink and a washer machine solely for the purpose of washing filter socks, I never liked the idea of cleaning them in the same machine we washed clothes in. That meant that I had to run water and a sewer line in, which isn't an easy task. 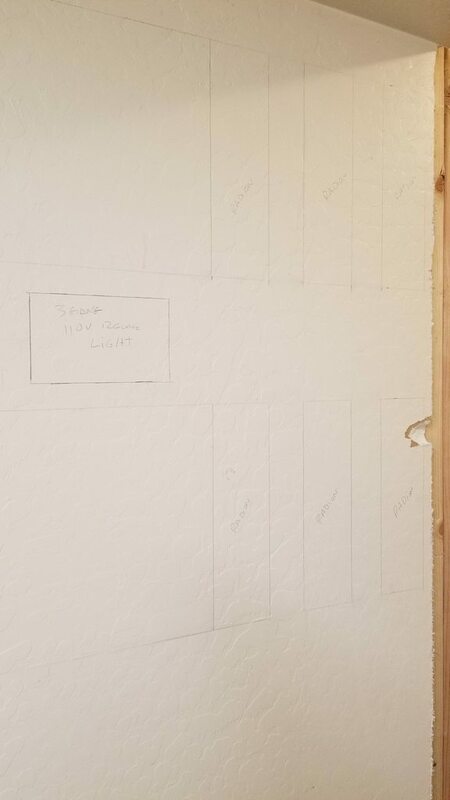 One good thing is that the room shares a wall with outside, I can easily punch holes in the wall to get everything to where I want it. 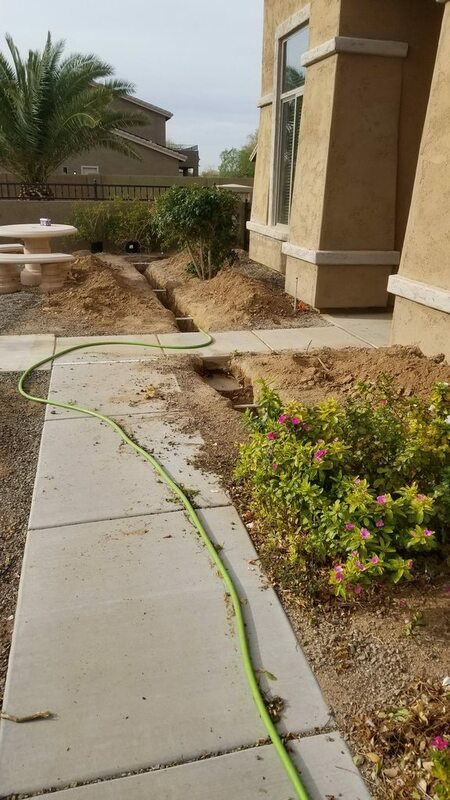 Water was easy to tap into because the heart of my irrigation system was only 20' away from the wall, last year when I had a 125A electrical service ran to the room (that’s right, the ground work for this project started over a year ago), I utilized the trench for that to tie into the water main. The sewer line on the other hand was a different story!! 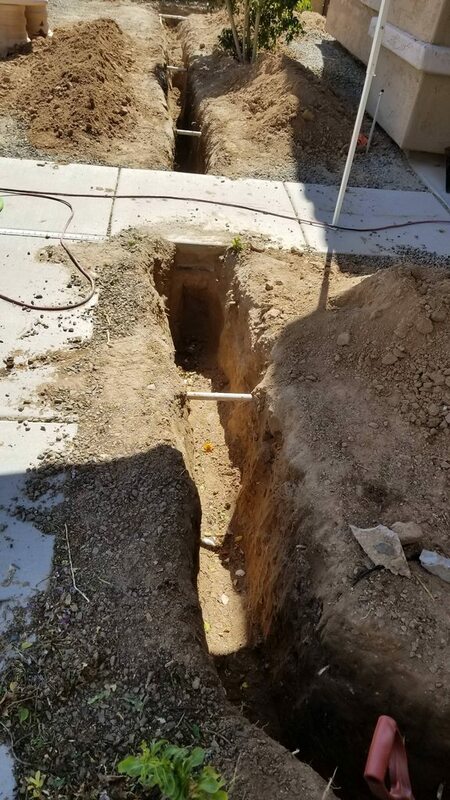 The closest place I could tie into sewer was in the front of the house 70' away at the clean out. Now, if you ever lived in a desert climate such as Arizona, you would know that about 6 inches below the surface lies a layer of soil called caliche, and if you knew that, you would know that it's considered "natures concrete". Calculating at the minimum drop per foot of sewage pipe (ABS) is 1/4", 70 feet of pipe would have to drop 17 1/2". 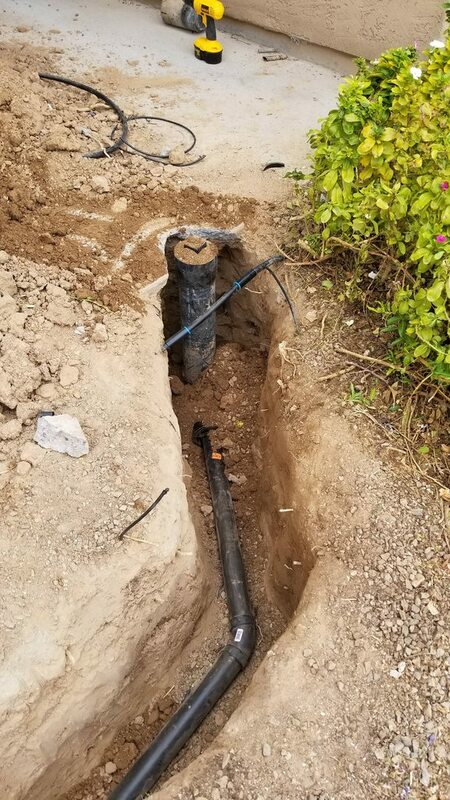 That doesn't include having to bury the start of the pipe as well as any other obstacles like other plumbing, conduit, concrete footers etc... 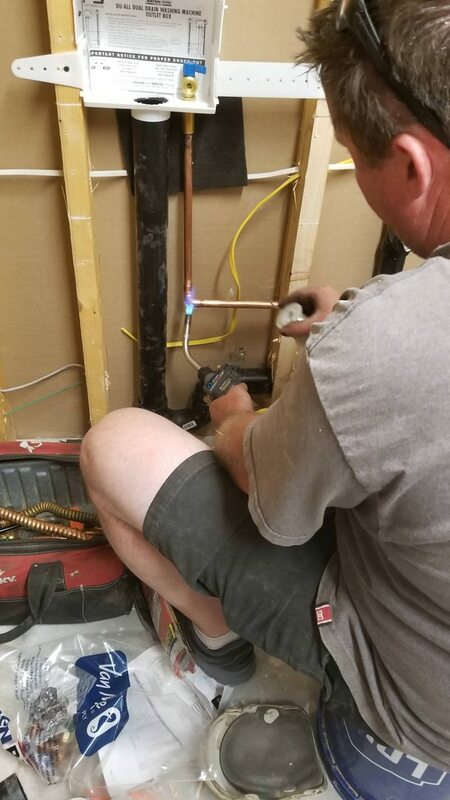 When factoring all that in, I needed to be at 24" at the end of the 70' run, plus deep enough at the clean out to comfortably work when cutting and installing fittings. I ended up at 32" down at the clean out. Luckily my neighbor has an electric jack hammer with a spade bit that made the work a little easier (instead of breaking my back shoveling, I broke it wielding the heave jack hammer). I know what you’re thinking, why not just use a trencher? Well, The amount of existing irrigation that was in the ground already would have given me a side job of repairing all of it. I tried really hard to push back all the rock before piling dirt but the piles kept getting higher and higher! I had to remove a lot of bushes to dig this trench, good news is, the new bushes will have an easier time to root down in the softer soil. 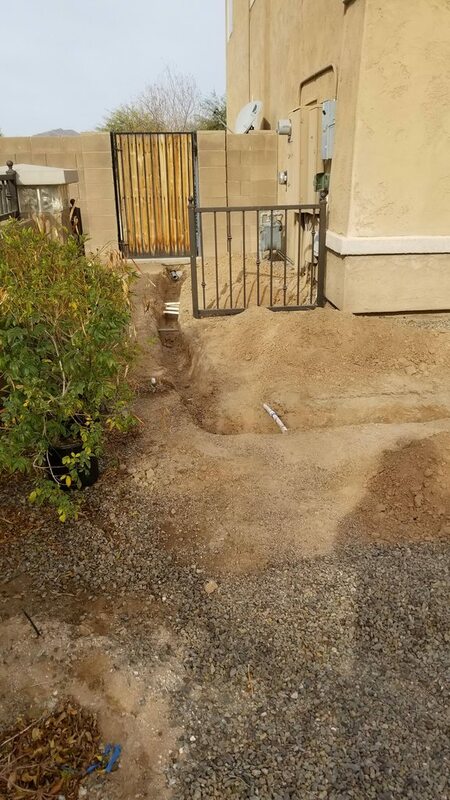 This took me a good 4 days to complete, and I’m glad it’s over, if I knew the amount of work it would have been, I would’ve opted out of having sewer and devised a clever way to drain everything outside a few feet away from the house. 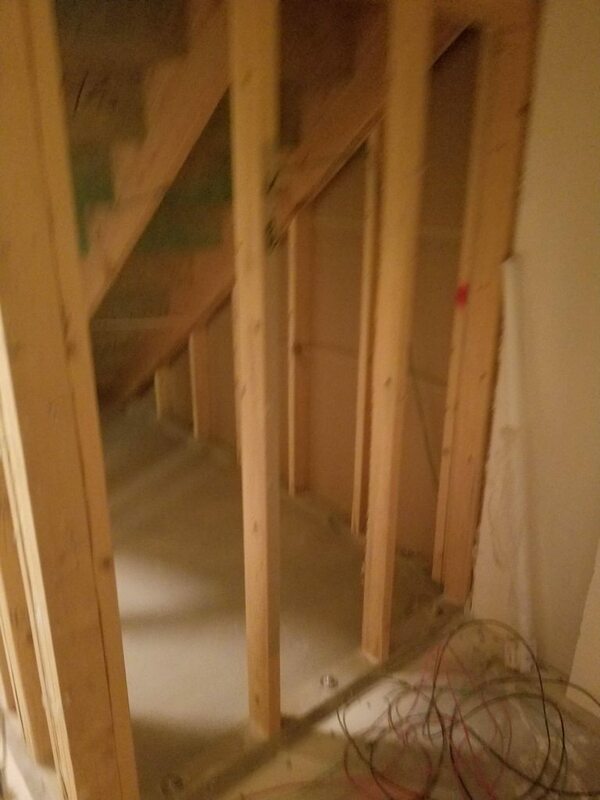 Here’s basically where I am in the project, I have a plumber coming over Thursday to at least get the ABS in the ground and buried, and hopefully Friday get everything roughed in inside the equipment room. Standby for more to come…. Hehe, no for the most part she has been supportive, I ask her for advise in decision making and purchases so that she knows we're doing it together. 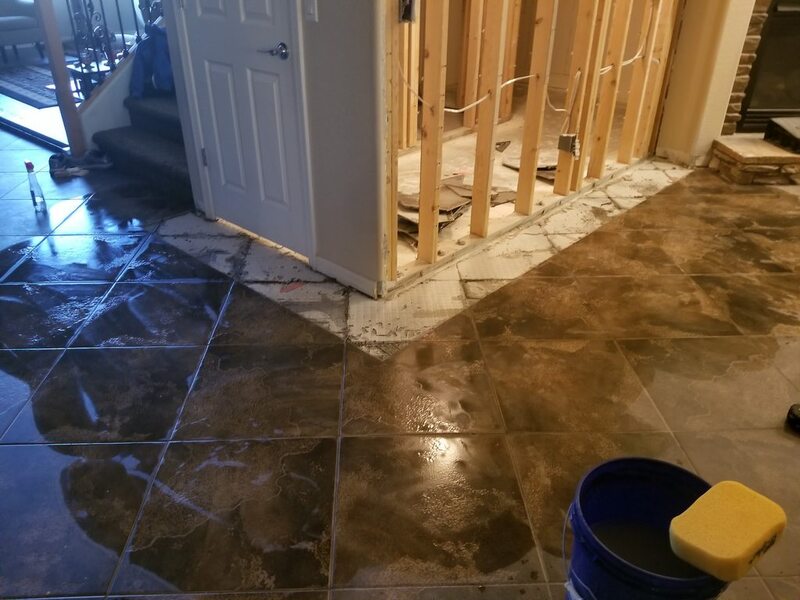 There's been a few times that she made comments about how other chores have lapsed or how much we've spent, but I look at that as she's keeping me updated on the financial side of the project. The fact is, she wants a tank just as much as I do, we just have 2 different perspectives, I want something to occupy my time and frustrate me, she wants the serenity of seeing a beautiful slice of the ocean in her living room. See... it's a win/win. Not much to report, I was able to lay the ABS and bury it. 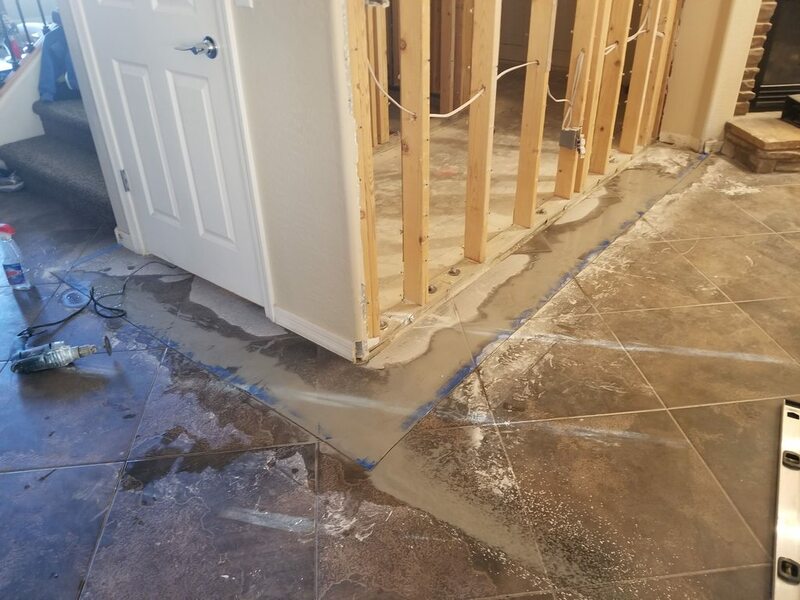 We stopped just shy of where the plumbing would come into the house, the plumber wont be back until early next week, so I just need to practice patients. What a big ditch for such a small pipe!!! I think I went overboard there. One thing that I learned is that ABS is expensive, for 70’ plus all the elbows and pieces for the inside came in just north of $200. I wasn’t expecting that. 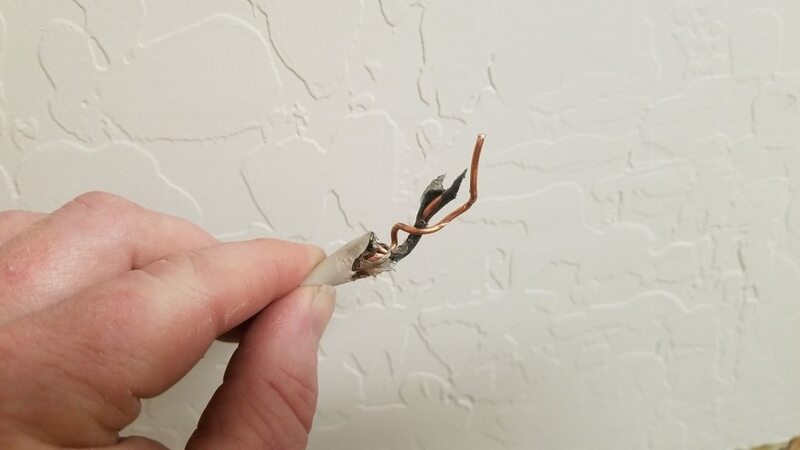 I also ran into a snag today when I found out that where I wanted to plumb in the sink was too close to the circuit breaker box. 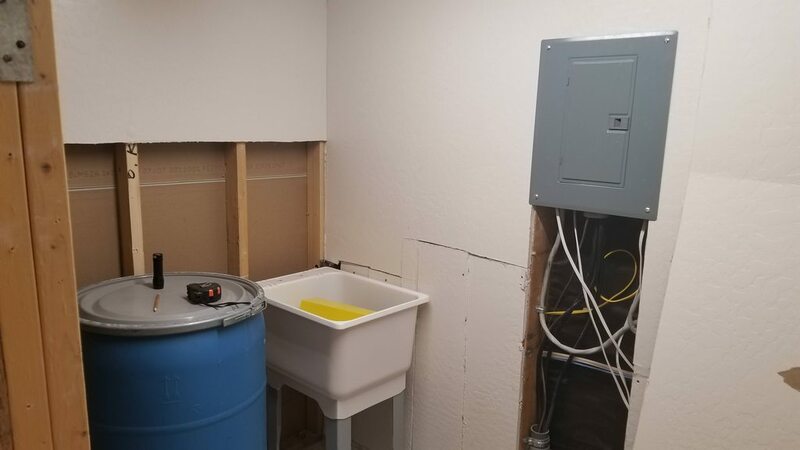 The electrician said that the water source needs to be 48” away from a circuit breaker panel, my plumber said 36”. I guess I need to get clarification, anyone know for sure? Please chime in. This means I have to rethink the 55 gal fresh water and salt water barrels. There’s enough room to stack them above each other (the top one on a shelf), that will make maintenance a bit harder but with the limited space, I may not have another option. Don’t forget I’m putting a washer machine on that wall as well. That’s it for now, definitely slow going, but hopefully well worth the wait. 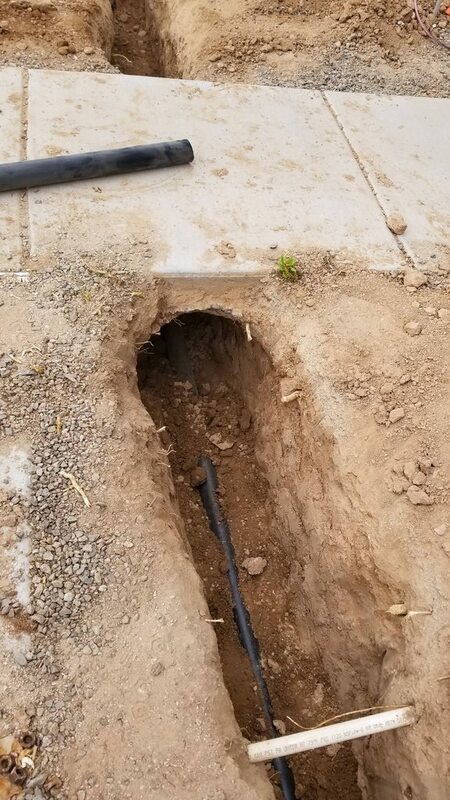 That’s a huge amount of work for the drain line! Well done! Tagging along to see the progress. You're not kidding!!! 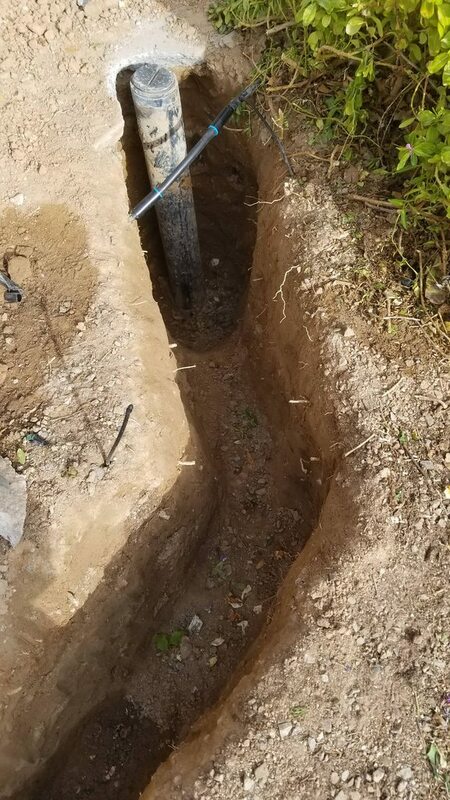 The good thing is that it's in the ground and the hard part is over. Hopefully the plumber will be back tomorrow to finish the inside up and I can press on. In the mean time, I blew the dust off of the Apex and started attaching the Radions to the WXM modules. It's funny how quickly I forgot how to program/navigate through the dashboard, I had to relearn just about everything!! After roughly 4 hours of fumbling through I'm finally making progress. I have 8 radions going over the main tank, 1 for a frag tank, and a total of 7 vortech pumps, all of those will have to be controlled by the WXM's. 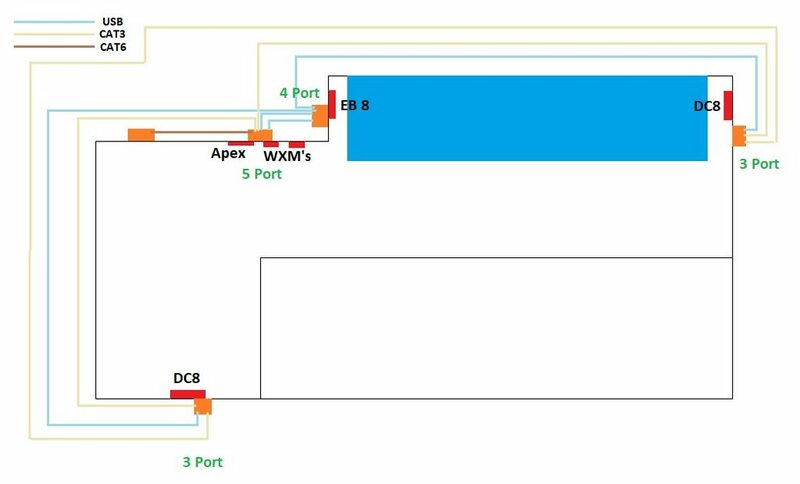 Each WXM will control up to 11 devices and I have a total of 16, which means I needed 2 of them plus I have a little room to expand in the future. After getting the lights programmed, I toggled through all of them to make sure that there weren't any conflicts, everything turned out great. 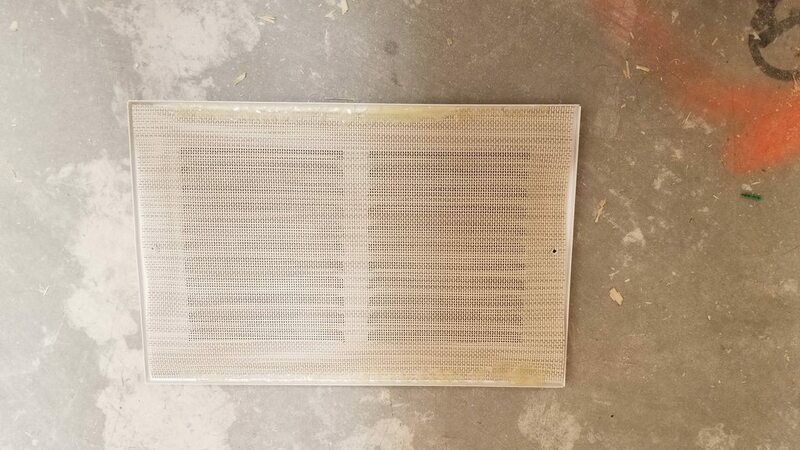 My plan is to mount those on an aluminum frame and attach a track system on the ceiling so that I can roll them back out of the way when I need to get inside the tank for maintenance. That's a ways down the road yet, I haven't even figured out plumbing or built the sump yet... So much to do. Wow what a great project. Looking forward to seeing the progress. If you need any help on anything let me know. I'll pm my phone number. I'd like to see it in person when the tank gets in there! as the specifics I wont be able to work that out until i'm at that points, one thing that I learned so far is how everything is so dynamic and when I change one thing, it effects something else. While waiting for by buddy to finish the plumbing, I decided it's a perfect time to clean all these Radions, they were really filthy! 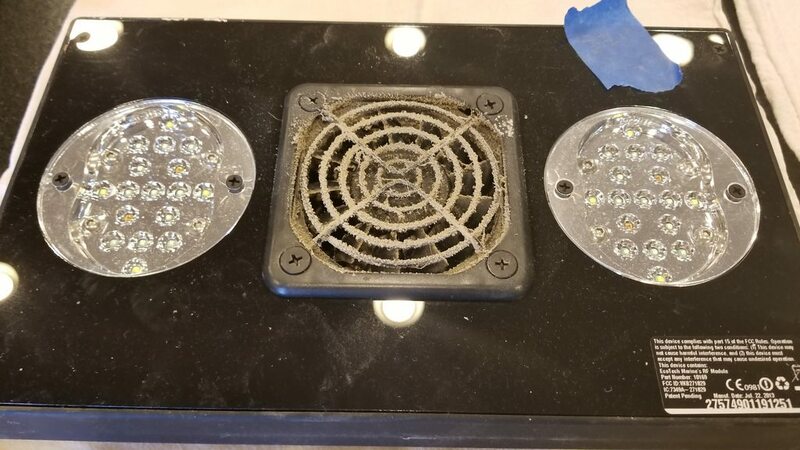 and some of them had so much buildup of dust that I highly doubt any air flow was going across the heat syncs. You can't even see the metal shield! 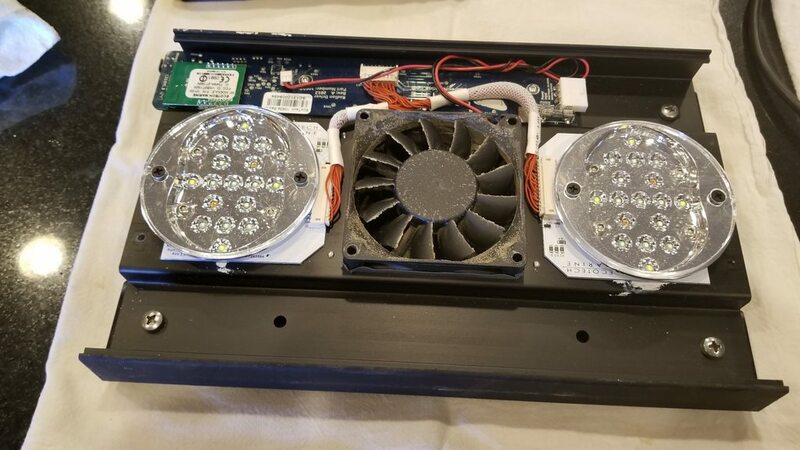 Not much to these things, a fan, 2 LED pucks, and the circuit board. Everything that wasn't electrical got a rinse in the sink. 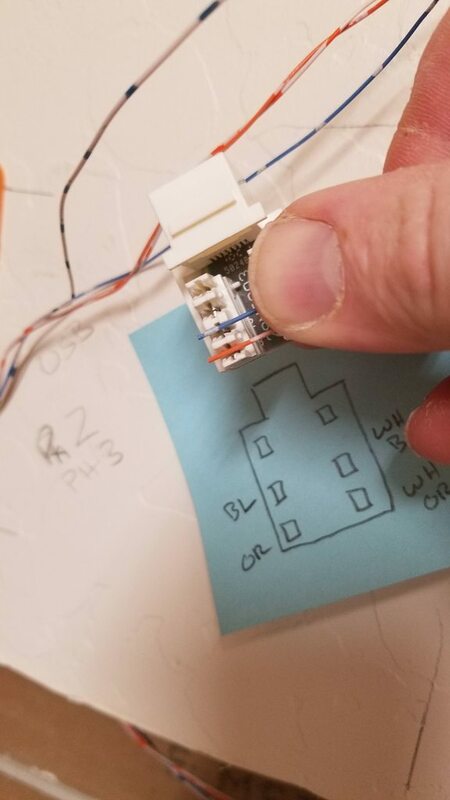 If you decide to do this, remember the the ribbon connector that attaches the capacitive touch sensors. 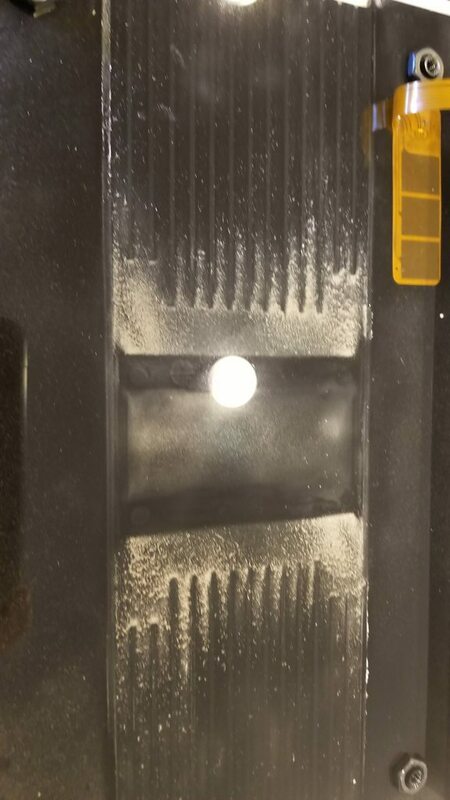 This one doesn't look too bad, however I believe I snapped this picture after I blew it off with compressed air. 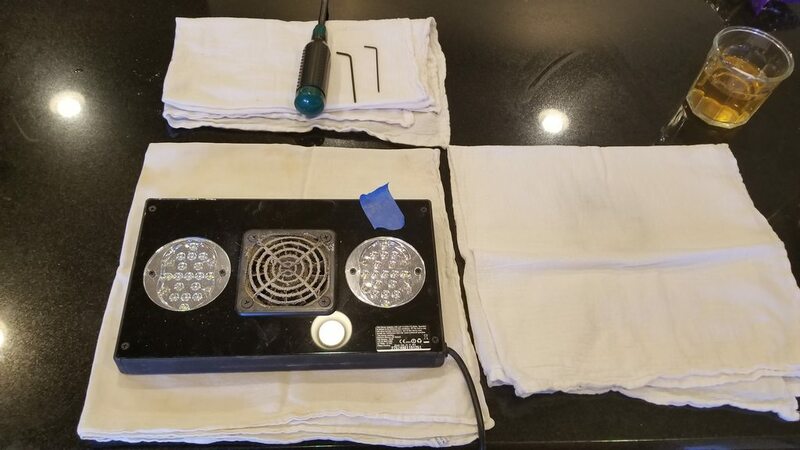 Here it is back together, I wont plug them back in for a couple days just to be certain that all the moisture has evaporated. I had to do that 8 more times, 2 of the radions are still running their original fans, I rummaged through my all my boxes of goodies and only found 1 replacement kit. 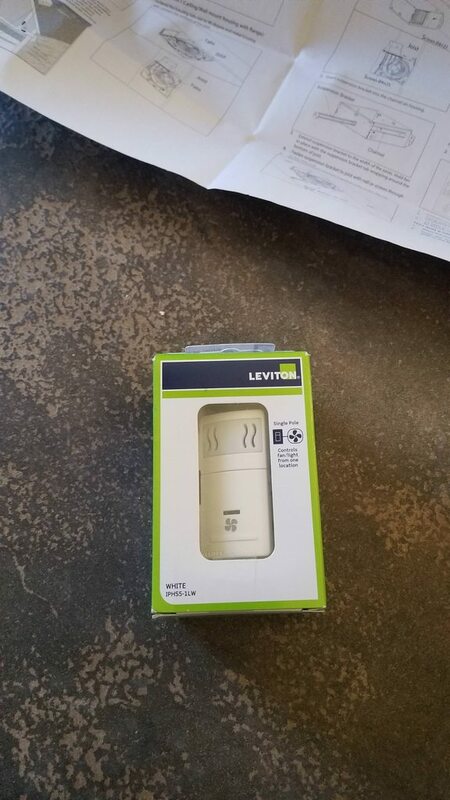 I chose not to install it because once I do, the fan of the one I didn't replace will go out. I will hold onto the new fan until it's needed. This one was so cakes with dust that I'm surprise it's still working. Why not replace the brass screws with stainless versions? Seems like a design flaw to me. 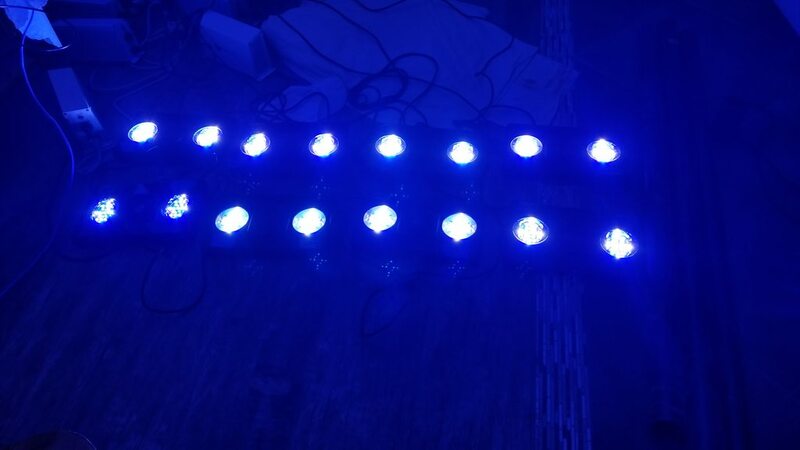 These are all gen 1 lights. 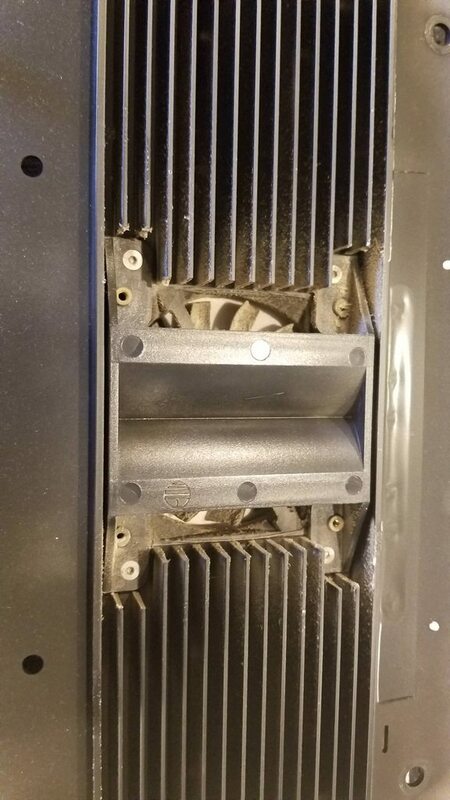 IIRC, circa 2012, many people were reporting that the fans were failing, which led the folks at ecotech to come up with a solution to retrofit a new fan in place of the old. 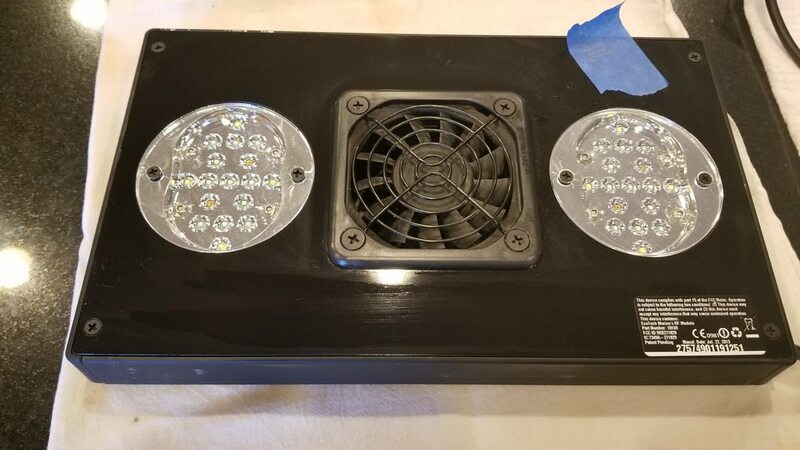 The old fan was glued in place with what looked like a clear RTV or silicone. 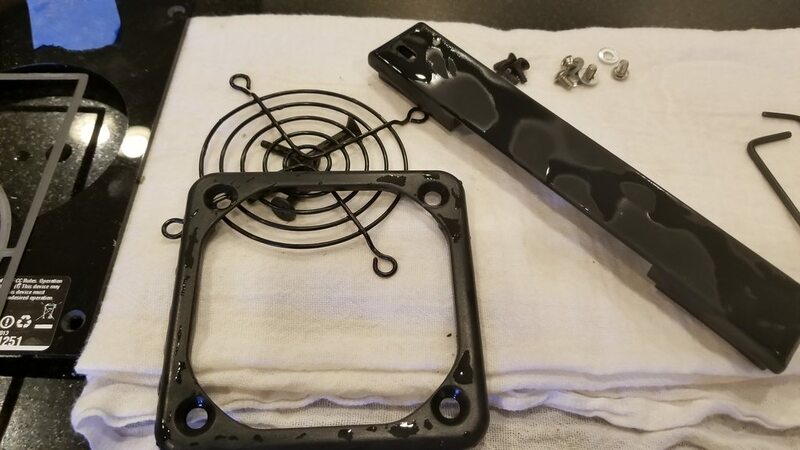 The old fan bracket didn't have those pressed in nuts like the new (lower left of the last picture), it was secured to the fan with 4 screws on the backside, while another 4 screws on the front side held the fan cover in place. The retrofit allowed a longer screw to simply pass through the fan and thread into the pressed in brass. In my opinion, that's the better way to do it. 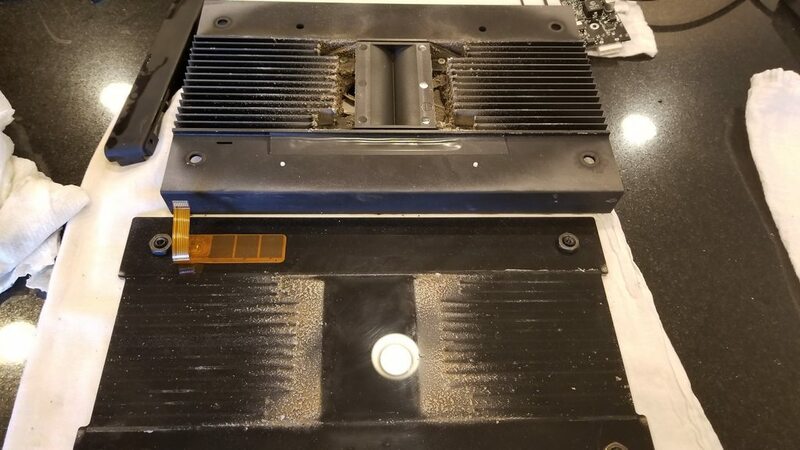 I would guess that ecotech was faced with time constraints to get a fix out the door and overlooked the material choice. 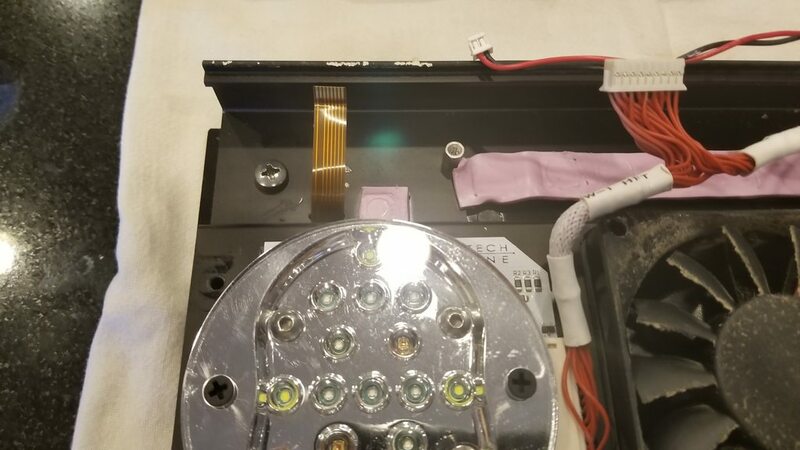 Outside of gen 1 lights, i'm clueless to how the insides of the newer ones look. Maybe someone can chime in... Perhaps there haven't been any reports as to these causing any problems, I just wanted to stress that in order to mitigate this as best as possible, don't cut the power to your radions at night just to silent the fans and save a few pennies. He did the same thing with the copper he measured, mumbled, drilled, cut and sweat. 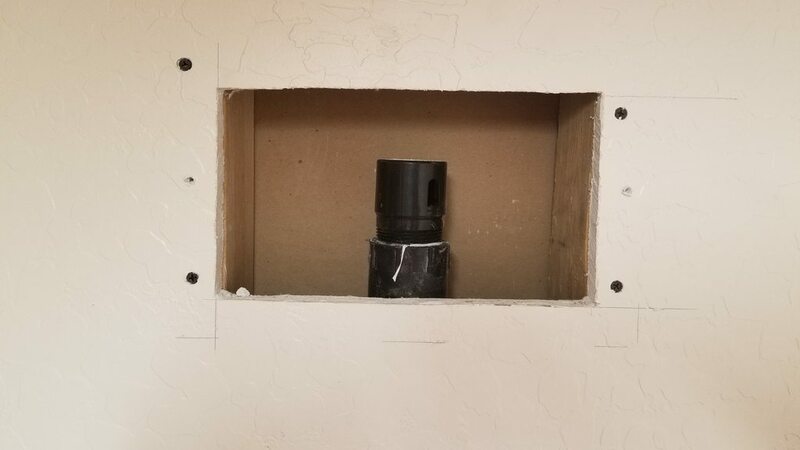 Some of you may want to know the purpose of the black pipe that is going up underneath the drywall. 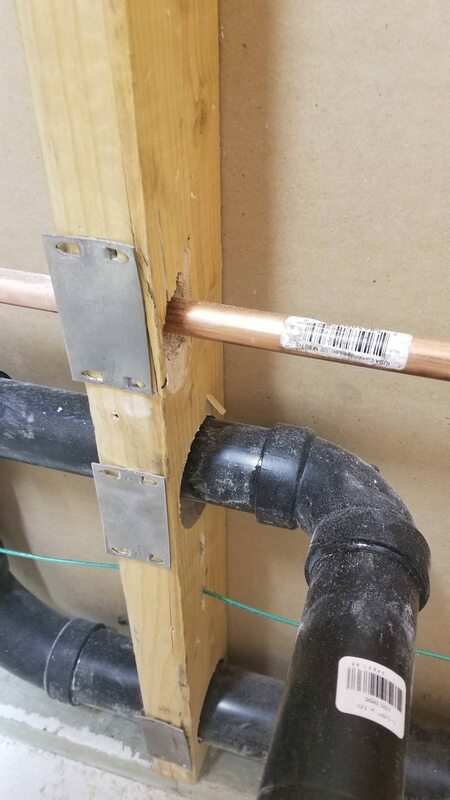 That is a vent pipe. 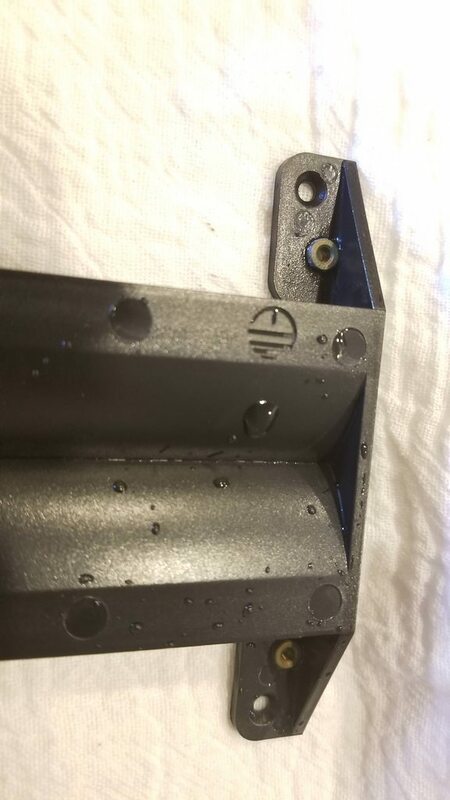 Most homes have vent pipes that simply run to the roof and the basic need is to allow the drain to breath, if it was sealed off the water running down the pipe will trap air and gurgle, as reefers I'm sure most of us have run across this in our efforts to plumb the tank. 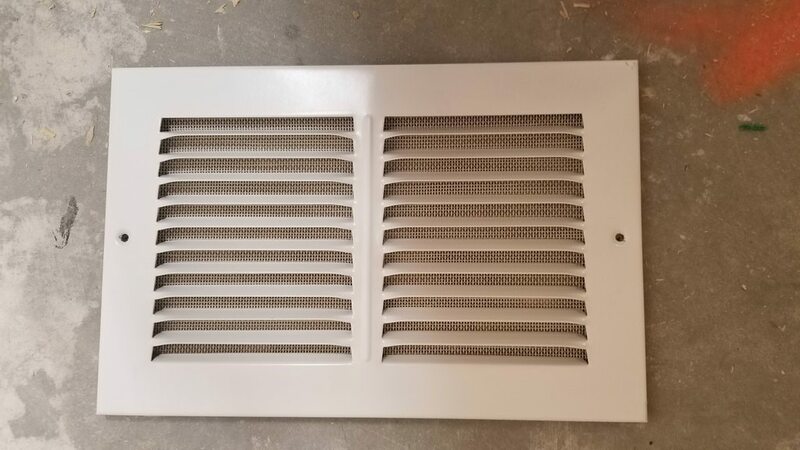 Use a large enough vent return that will gives easy access and allow that section of wall to breath. The only obstacle this now poses is that I am planning to put shelving up there, I will have to work around that and hopefully I wont have to gain access to service often if ever!!! 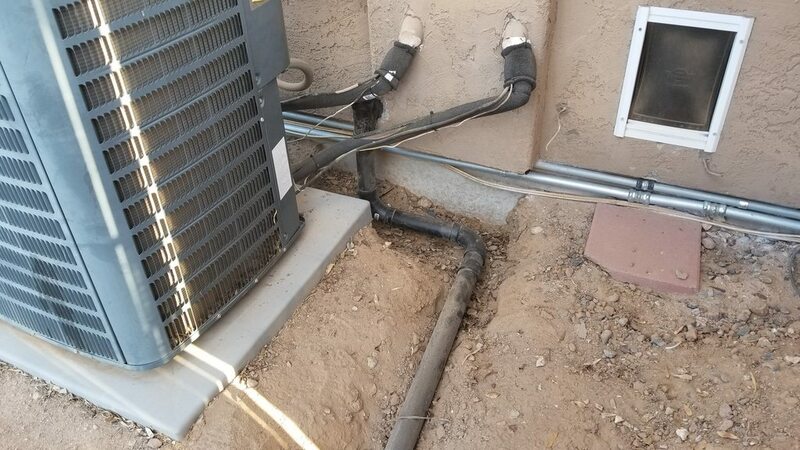 The clean out will be somewhat tough to get to just because of the air conditioning condenser. 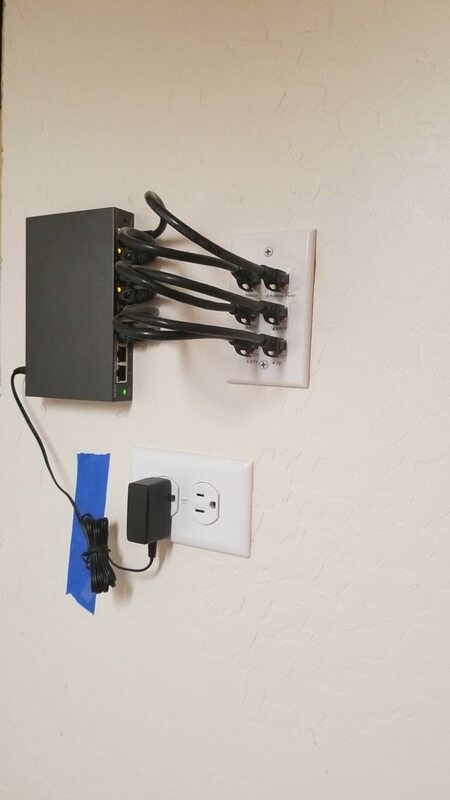 Now it's back to running all the data cables in the wall that need to be in certain locations. However, I also have side project that I started in conjunction with the fish room. 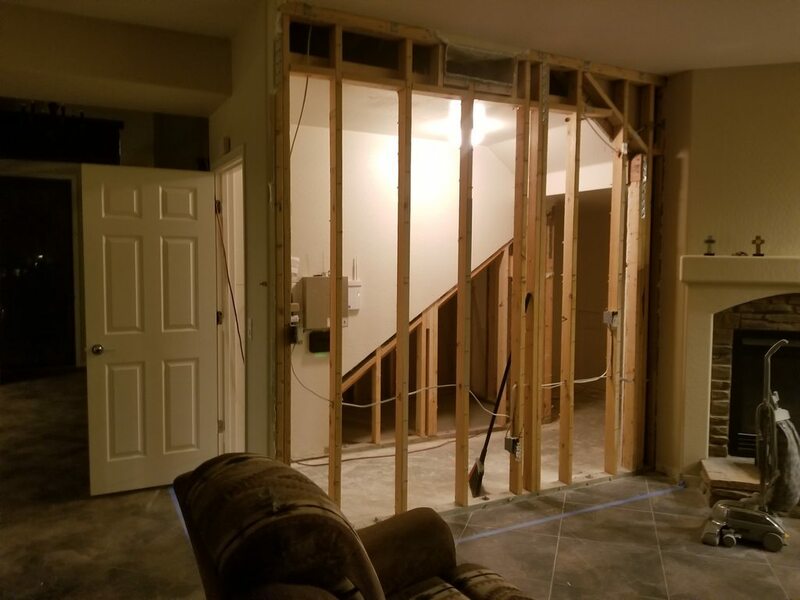 I closed off a loft that we had upstairs to make it a theater room. 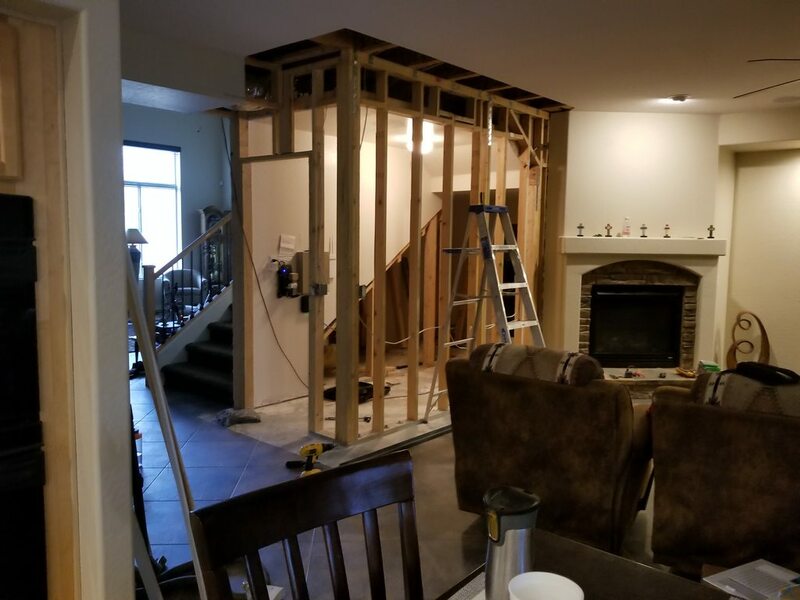 I'm in the midst of sound proofing the floor and walls... the one wall I put up has been sound proofed but the rest are still in need. 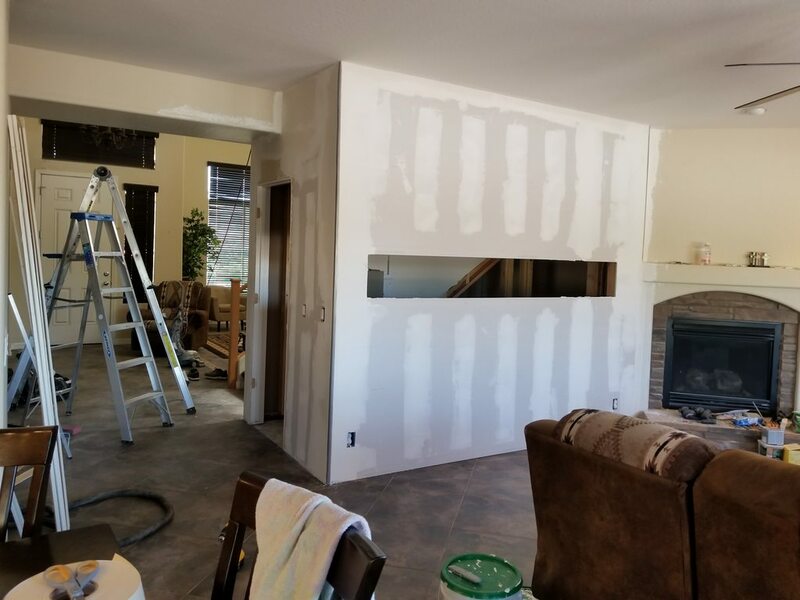 What's pressing is to finish the mudding of the drywall then I can texture and paint it. it's becoming an eye sore... that will consume most of my day. Last edited by Sisterlimonpot; 03/27/2018 at 11:15 AM. Thank you sir! When I saw that Nanook posted, I thought, "uh oh! What did I do wrong?" I often lose sight that you guys are hobbyist before being a moderator. 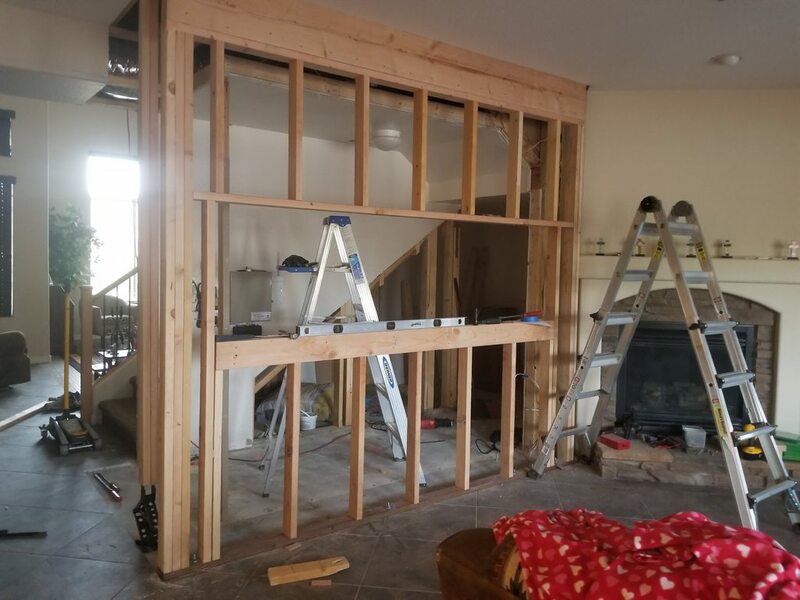 'columns' of 2x6's that are 7 studs wide, drilling through it was a challenge because I had to navigate around other 110v lines that were already in the wall. 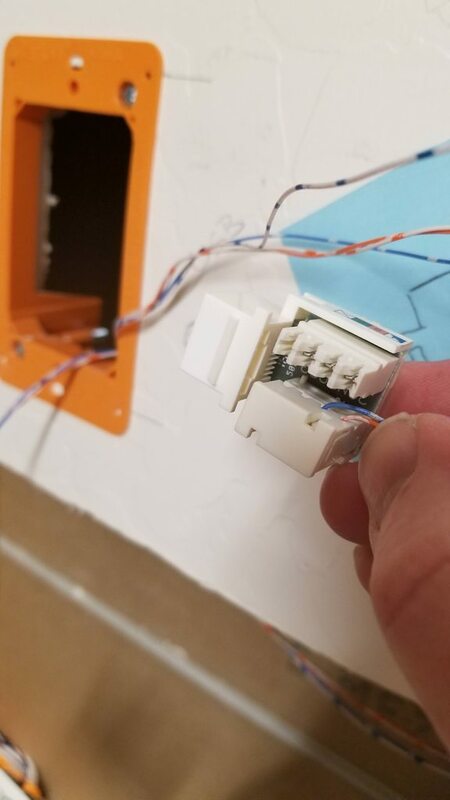 As I was 5-6 studs through I bored into an existing hole that had 2 romex 110v and 1 cat6 cable, I didn't know it until the lights in the equipment room shut off. That's not good!!! In the picture below, the hole with the arrow is what I drilled. 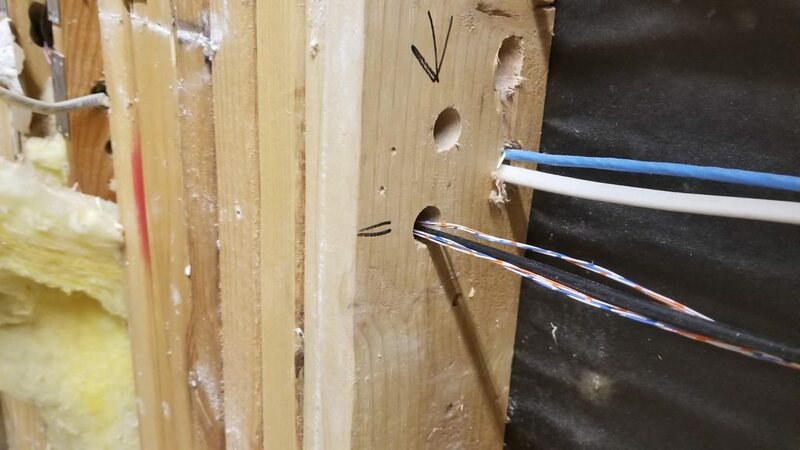 The hole that it intersectedis the one with the romex and blue cat6. 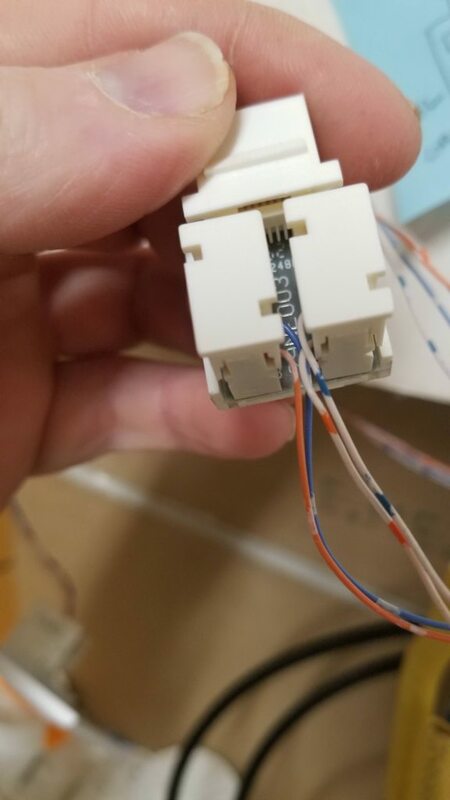 I severed an entire romex cable but luckily I didn't damage either of the other 2 wires. In the picture I already pulled out the damaged romex. 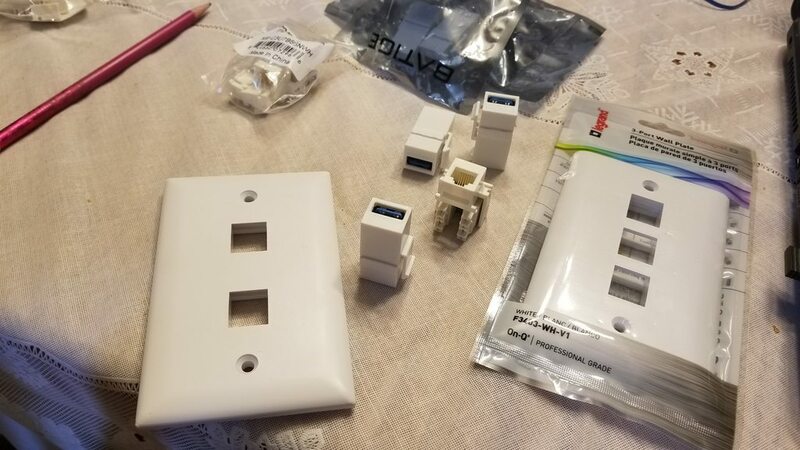 The bad news is that I can't simply splice the wires back together because the outlet box would have to go right under the sink and it's not a gfci protected circuit. The good news is that where the wire was cut was in between the circuit breaker and the first light in the circuit. Which means I can simply abandon the wire from the box and attach the broken wire to the new sub panel in the equipment room. 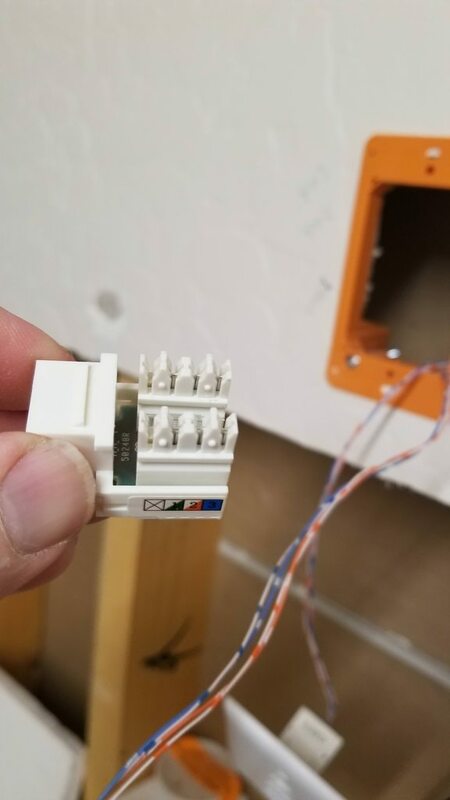 Instead of the sub panel out side, it went to the sub panel inside. 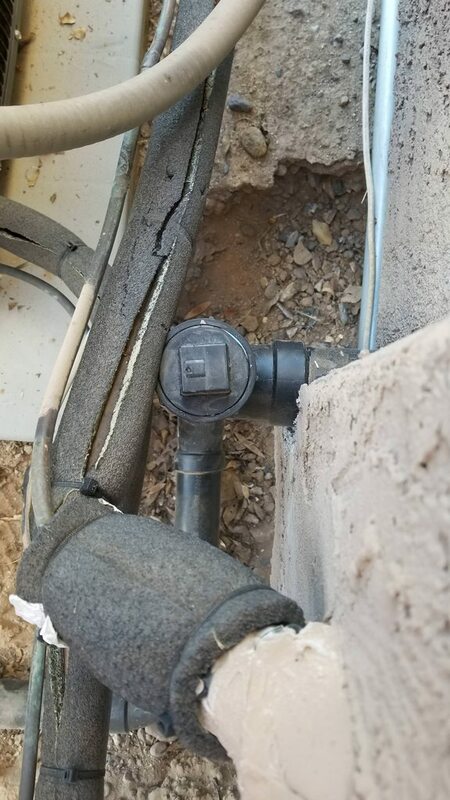 If that wasn't an easy fix, i don't know what is. No matter how I feel about this being finished, once I close off the walls there's going to be a vital cable that needed to be added. At this very moment I think that I've covered all my bases... That's when you say, "ignorance is bliss"
I drew out my plans, mapped out what was necessary with the current equipment that I have, ran cable for future expansion. Since I've chosen a long time ago (for many reasons) to use Neptune systems as the brains of the operation, I had that in mind while planning this out. 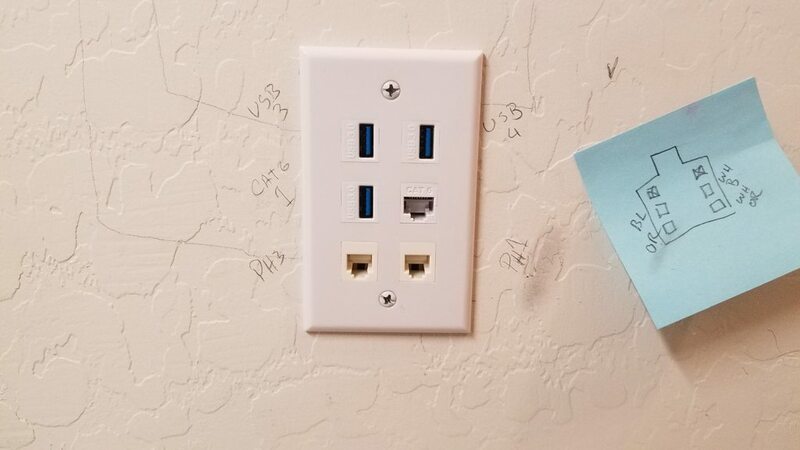 Seeing that the EB8 is going to basically be the hub for all the USB ports, I picked 3 locations in the room to drop USB access as well as 2 locations to have a possible DC8. 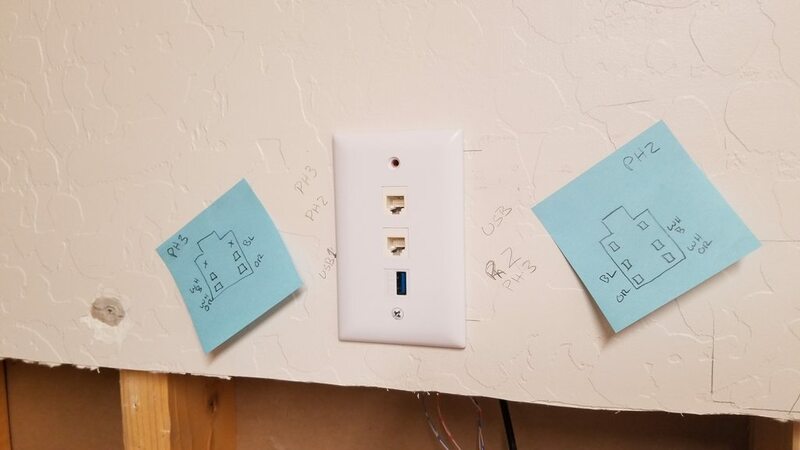 Lastly I have an 8 channel port switch in the corner of the room that runs to various locations throughout the 1st floor, I'll tap into that to provide a direct connection to the apex. 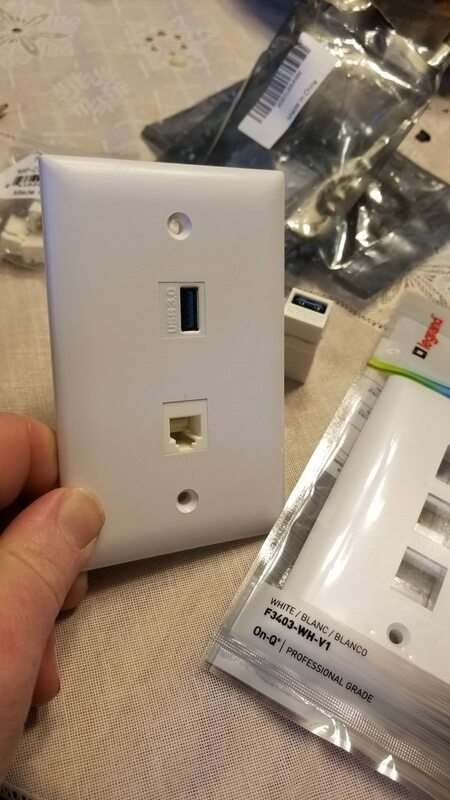 the USB and CAT6 adapters are a straight female to female and simply needs that specific cable behind the wall, making it extremely easy to run wire and plug it in. 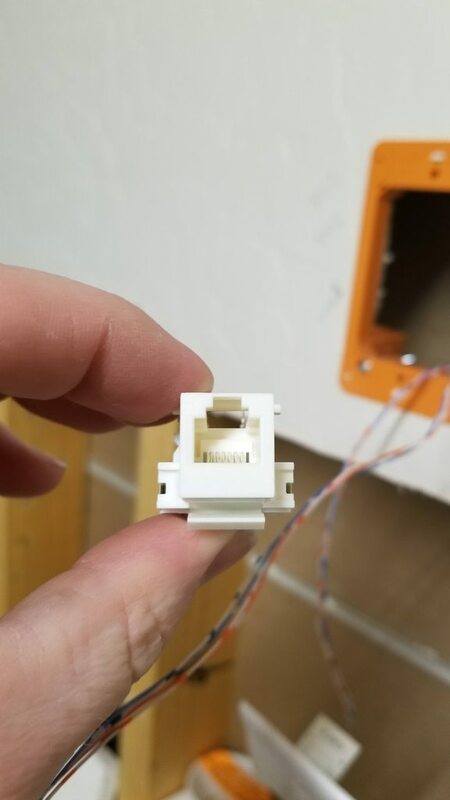 The downside to not making my own cable is the cost. 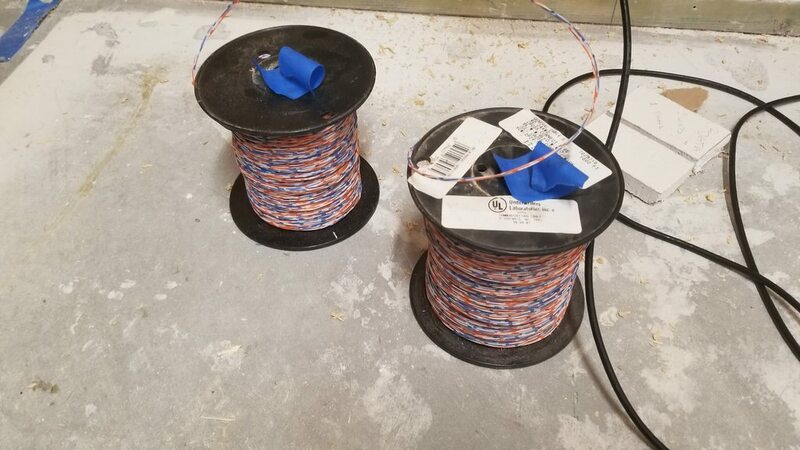 At a garage sale many years ago, I picked these spools of wire for $2. I held onto them because I knew one day I'd use them. 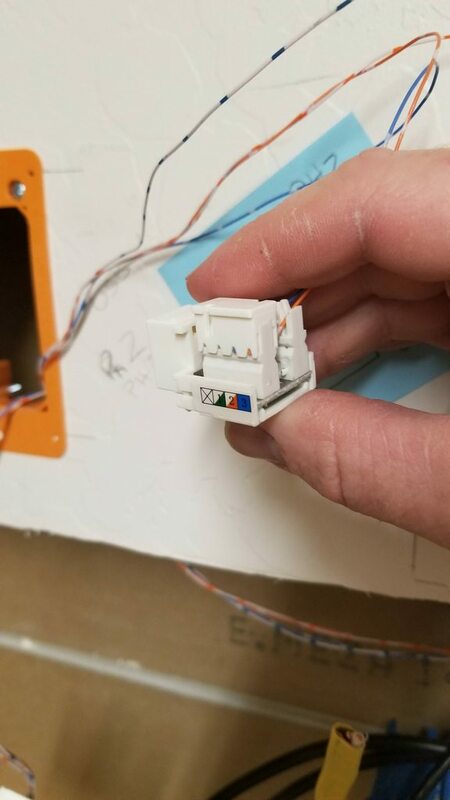 Since none of you are reading this anyway, (if you are thanks)just look at the pictures of how I connected the wires. 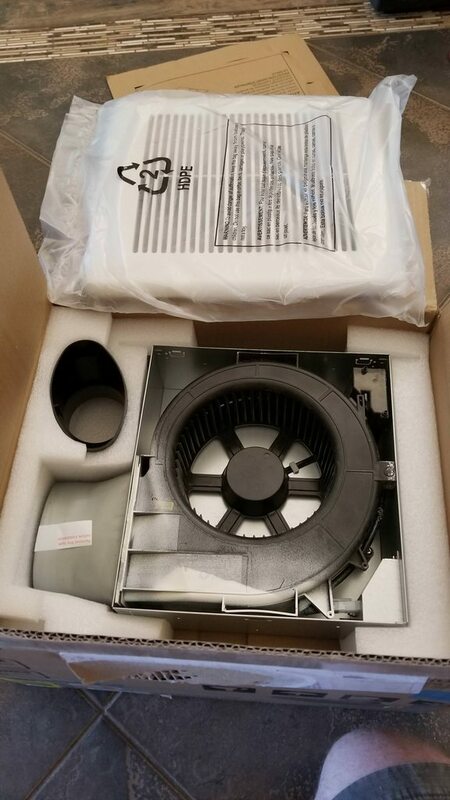 I purchased a 0.6 sones 80 cfm exhaust fan that will be controlled by a humidistat. 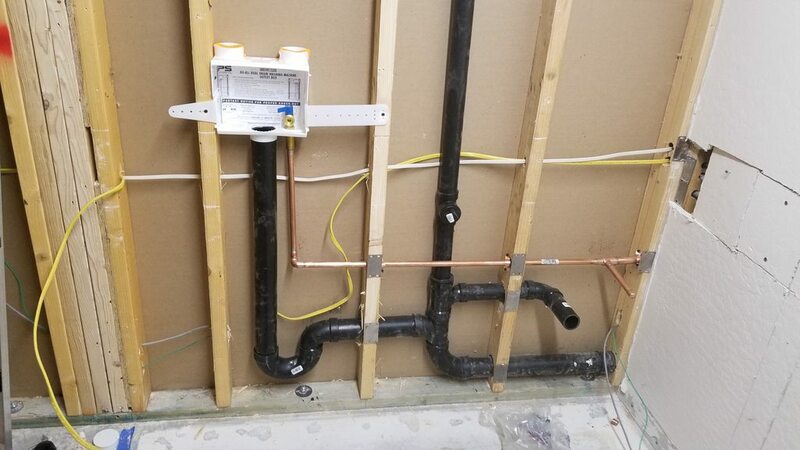 Once I get that in and connect the 1/4 water lines for the ATO and hopefully an automatic water change system down the road, I will be able to start drywalling. This has certainly gone "next level." 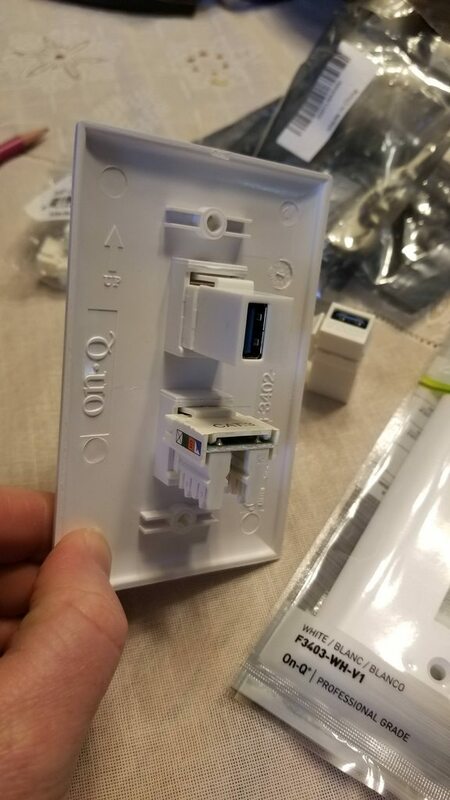 :0) I'm eager to see how the ports are going to work. Really great attention to detail. It will look so clean and hopefully make things easier for you as well. 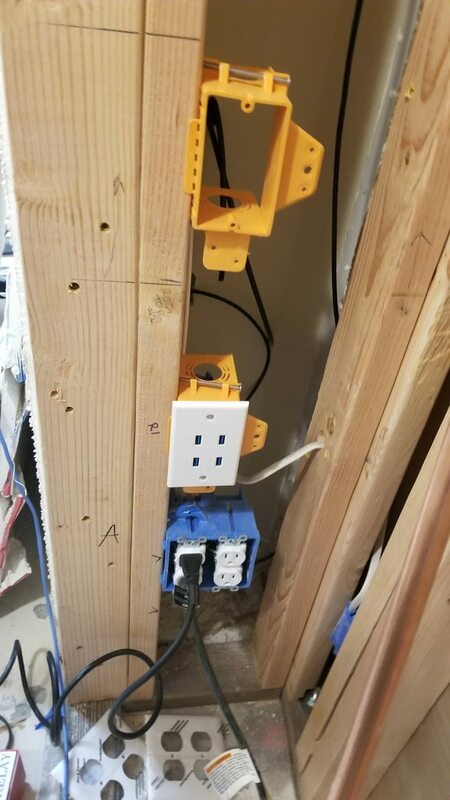 I have been trying to figure out a good way to do something similar on my own system... so I don't need to feed wires through the wall. Just a problem if I have to make a change, etc. That is a big concern, all this work will be worthless if I still have to route wires throughout the room. I've been thinking that I'm going to run more wire and have it sit behind a wall plate just for future expansion. 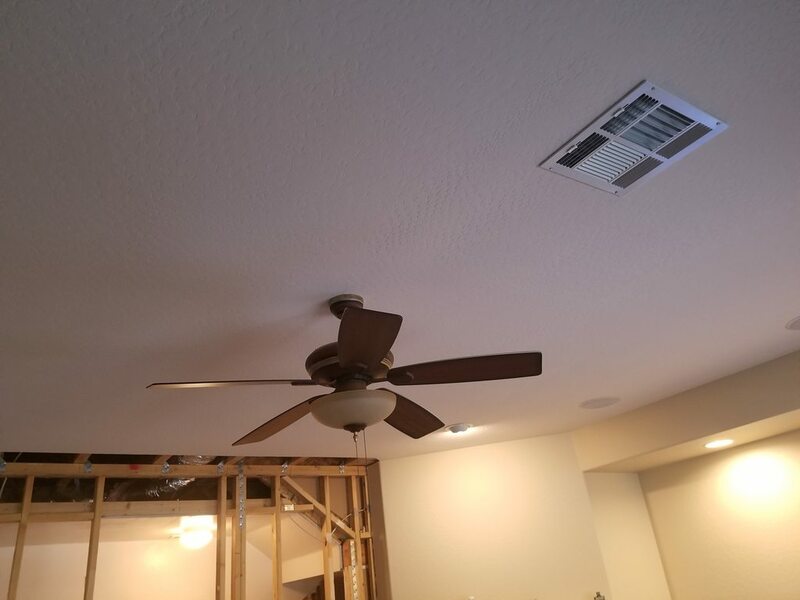 Today I want to get that exhaust fan up and running and run a separate exhaust port for a portable air conditioner, then I can close walls. Found your build thread. As usual, your going all in. I see you've taken time to plan it all out. Things are looking good. So whens the estimated "WET" date?